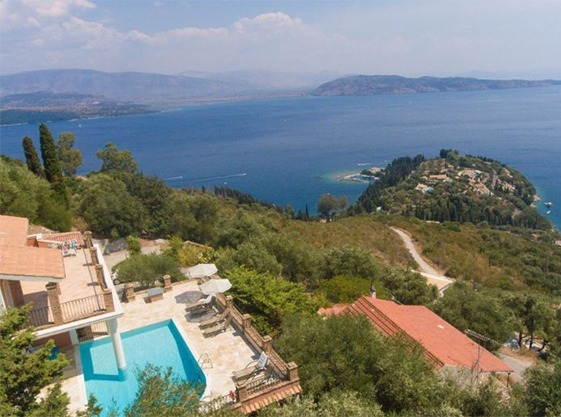 Villa Emilios is located in the outskirts of Vingla and just over Kalami Corfu. It is about 5 minutes drive from Kalami bay and looks out at Kouloura, Kalami and Agni bay. Its extensive views stretch out towards the Ablanian mountains, the Greek mainland and the dividing sea. This detached vacation rental property is air-conditioned and sleeps up to 6 people with 3 bedrooms, 4 bathrooms along with private swimming pool and sea views. A popular destination for couples, Kalami is also ideal for a family holiday with tavernas, safe swimming, water sports and boat hire – everyone is catered for! The living room has sofas, WiFi Internet, Satellite TV, DVD player, dining area and ornamental fire place. There are patio doors to the pool terracealong with sea views. Villa Emilios has 3 air conditioned bedrooms. Bedroom 1 is air conditioned with a double bed. Bedroom 2 is air conditioned with 2 single beds. En suite bathroom. Bedroom 3 is air conditioned with 2 single beds. Villa Emilios has 4 Bathrooms. Bathroom 1 is a family bathroom, bath with shower. Bathroom 2 is a family bathroom with shower. Bathroom 3 is a family bathroom with shower. Bathroom 4 W/C. There is a games room with table tennis situated in the basement, as well as a laundry room. Taxi transfer can be arranged for you on your arrival. The taxi driver will welcome you either at the airport or at the port, holding a sign with your full name and ‘Villa Emilios' written on it. . Using the bus service is another option. Make sure you get to the 'green bus station', though, in order to catch the right bus. Renting a car is by far the best choice. We make sure that you will have absolutely no difficulty reaching Villa Emilios, since we provide you with detailed driving instructions.